In the Waldpark Brewery, about 5,000 samples are collected daily throughout the entire production process, and up to 16,000 analyses are performed. All measurements and analysis results are archived in the Laboratory Information Management System, which allows for a seamless tracking of all product batches. Thanks to this complex, self-control system, the Warsteiner Brewery was awarded, as the first brewery worldwide, the food quality certificate according to the international standard DIN EN ISO 22000:2005. The Warsteiner Brewery expects its suppliers to abide by the appropriate regulations concerning environmental protection and humane work conditions. This responsibility is listed in the current procurement guidelines, in the procedure instructions, and in the code of conduct for our suppliers. These regulations serve as benchmarks for all suppliers and employees participating in the procurement process. In its advertisements, the Warsteiner Brewery strictly follows legal regulations and ethical standards. According to the integrity principle, Warsteiner is also committed to adhering to the German Advertising Council’s codes of conduct for the commercial communications concerning alcoholic beverages (2009 Edition) as well as complying with the Brewer’s Code and the sponsoring guidelines. Additionally, as a member of the Central Association of the German Advertising Industry (Zentralverband der deutschen Werbewirtschaft [ZAW]), the Warsteiner Brewery presents its advertising material for advisory pre-evaluation. 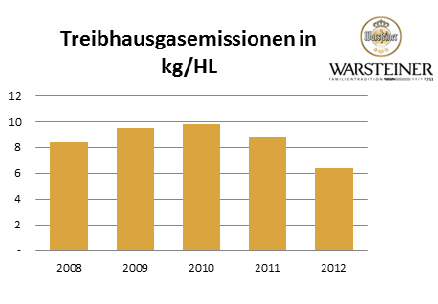 In the past years, the Warsteiner Brewery succeeded in lowering its specific water consumption to 3.46 hectoliter per hectoliter of brewed beer. The energy consumption for the production of this amount is currently 135 mega joules. 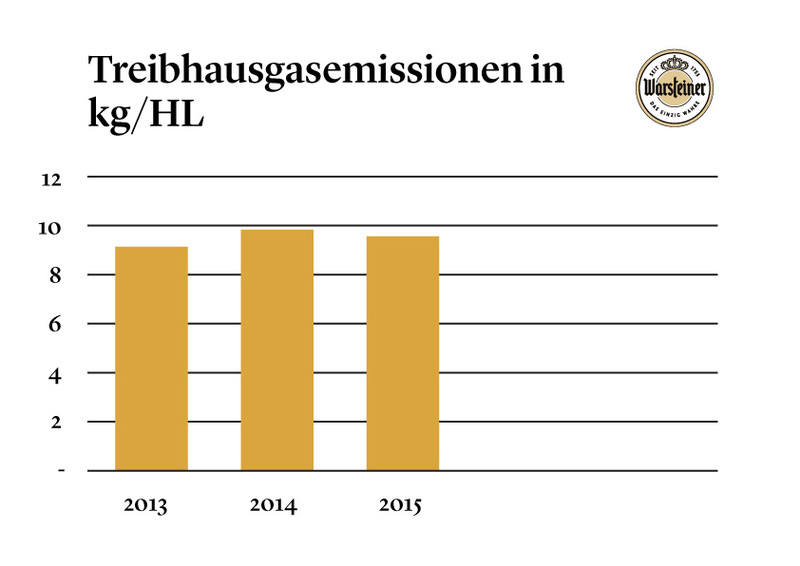 Based on these numbers, Warsteiner belongs to the top breweries worldwide with the lowest energy and water consumption for its beer production. The Warsteiner Brew Academy for Research and Development significantly contributes to this development. In this test brewery, new products can be developed on a smaller scale, their quality improved, and the use of resources and energy further optimized. With numerous technical innovations – for instance, in the brew house as well as updating the ventilation and lighting systems – the Warsteiner Brewery has been able to further optimize its energy consumption in the past several years. A significant contributor in this effort is the proprietary block heating power plant, which produces electricity from natural gas and additionally uses the generated exhaust heat directly in the brewing process. Up to 5,000 tons of CO2-equivalents are saved per year. Since 2012, the Warsteiner Brewery has fulfilled the norm DIN EN ISO 50001:2011, and thus is the first brewery enterprise in Germany that has a certified energy management system. In 2005, the Warsteiner Brewery began operating a proprietary rail siding with container terminal. This siding contributes to the sustainability effort by moving truck traffic from the road to the rails. Each year, about 5,500 truckloads, or up to 1,700 tons of CO2 and 5,300 tons of nitrogen (Nox), are saved. Through memberships in urban and regional tourism associations as well as through individual funding of public service projects, the Warsteiner Brewery supports its surrounding region in the northern Sauerland. The Paul Cramer Foundation (Paul-Cramer-Stiftung), launched with financial backing from the company, provides funding for cultural events, youth and senior citizen initiatives, charitable work, and sports projects in the town of Warstein. On an international level, the Warsteiner Brewery is involved as a member of the Warsteiner Partner Funds (Warsteiner Partnerfonds e.V.). Since its inception in 2005, this non-profit organization support projects focusing on children and development aid. The latest aid project, supported by the Warsteiner Partner Funds with donations and non-cash contributions, focuses on building and maintaining birthing centers in Eritrea in cooperation with the Archemed organization (Archemed e.V. ), which is headquartered in the town of Soest. As an international beverage producer, the Warsteiner Brewery pursues sponsoring partnerships beyond its home region. The company engages in a promotional strategy that increasingly includes specific topics and engagements with a focus on experiences and events. Furthermore, the support of first-class sporting events remains a component of the company’s sponsoring mix. In addition, Warsteiner partners with preeminent events in hot air ballooning, equestrian sports, soccer and handball. The Warsteiner Brewery offers eleven different apprenticeship programs and two work-study programs. Its graduates regularly receive prizes in the “Best of …” category of the Industrial Commerce Chamber (Industrie- und Handelskammer [IHK]) Arnsberg. In addition to competent apprenticeship training, Warsteiner also offers life and job perspectives. About 40 % of the apprentices and trainees in the last ten years are now employees of the brewery. The safety representatives and experts play a significant role regarding occupational safety and function in each department as a direct contact. The number of safety representatives is 300 % above the required number for a company of this size. This circumstance also contributes to the fact that the accident numbers at Warsteiner are significantly lower than the industry average. All employees may submit concrete proposals to improve the occupational and health safety of their work place and how to maintain their productivity. Each week, the “Health Committee” evaluates the submitted statements, generates concepts, and initiates the appropriate implementation The committee includes representatives of the upper management, the Workers Council, HR department, occupational safety and work protection department, the company physician, a safety representative and a trusted representative of the employees with disabilities. About 10 % of the employees of the Warsteiner Brewery work in second, third or even fourth generation as part of the Warsteiner team. The average length of employment at the brewery is 17 years. This long-standing loyalty is also a consequence of the numerous opportunities to pursue a work-life balance, among them flexible work time models and special offers such as the Warsteiner Adventure Camp, a camp for children of employees designed to relieve the parents during summer school vacation. Furthermore, common festivities, including the Warsteiner Family Day every two years, an annual soccer tournament or the Warsteiner Team Party, contribute to fostering a mutual understanding and cohesion among us.